To advance toward an academic excellence. Producing quality and moral graduates recognized by national and international society. Developing and promoting researches for teaching and novel knowledge with transmitting to social. 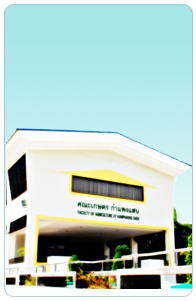 Faculty of Agriculture at Kamphaeng Saen is becoming an academic leader in agricultural science for food, energy and environment. To produce graduates with qualification and moral; to establish agricultural knowledge through research and integrate new knowledge with local wisdom that will lead the country direction for sustainable development and to promote and conserve agricultural tradition, custom and arts.